From the moment they are born, cavies or guinea pigs can adjust with their surroundings using their senses. It is regardless of their habitat, whether it is in the wild or a domestic environment. It is through these senses that they can grasp a feel of their surroundings. But different creatures have different levels of efficiency when it comes to their feelings. Although animals may be inferior compared to humans regarding intelligence, the fact is some animals have certain senses that are even superior to ours. Amongst small animals, very few can beat the guinea pig when it comes to cuteness and overall gentleness. But how do these cute little furballs fare when it comes to their senses? In this article, our primary focus of discussion will be the guinea pigs or cavy, and their feelings. Particularly their sense of sight. How well can they see? How far can they see? Are guinea pigs color blind? Can Guinea Pigs See Color? Guinea pigs are quite famous, and this is partly because of their eyes. It’s not often that we see creatures sleeping with their eyes open. By the time they are born, guinea pigs are already able to use their eyes. Tactile hair that grows on their muzzle also aids in finding their ways in the dark. It also helps figure out where the hole is. This adaptation is also advantageous when they try to move around and find their steps in the night. In the wild, guinea pigs can find their way around in the dark and escape predatory attacks by creating for themselves a branched network of paths. According to recent studies, several aspects make the guinea pig’s vision superior to humans. They are capable of seeing at least 33 images every second while humans can see only 22. It means they can perceive dynamic motion much better than we can. Their visual range is also more comprehensive than ours, at 340 degrees. Human vision can only cover 180 to 200 degrees. Like modern cameras, their eyes can see almost their entire surrounding without having to move their heads. It is a useful adaptation to nature which guinea pigs can benefit from. For being prey animals, it is vital for them to see danger or predator without creating unnecessary motion. Some scientists claim that guinea pigs have poor eyesight. It is quite confusing. How can they have a poor vision when they can see more images and cover a more comprehensive visual range than humans? Perhaps a good explanation will be that the way they have successfully adapted to nature no longer requires them to have superior eyesight. The most useful aspect of their vision would probably be their full range of view. It allows them to immediately identify potential attacker from all sides without having to make any movement. Alongside this is their excellent sense of hearing and smell. If you try and search the web about whether cavies can see color, you may find a lot of different, contradicting opinions. If you want to find out the accurate answer, then you must do a few experiments. The procedure requires an odorless food such as lettuce. Place it in a bowl that has a specific color. You can do it again and again until the pig starts associating the color of the dish with the lettuce. The result reveals the guinea pig seeking the same bowl, regardless of its arrangement. This experiment proves that when incapable of using their sense of smell, guinea pigs can make a correct judgment based on what they visually remember. Based on some scientific discoveries, regarding the color spectrum of guinea pigs, it is believed that these creatures have what is called a dichromatic vision. Additionally, guinea pigs have some amount of sensitivity towards the color green. They are capable of differentiating between the colors red, blue, yellow and green. It leads to the conclusion that cavies can distinguish colors, although not as well as humans. Moreover, guinea pigs have better color vision than dogs, cats, and other parts of the animal kingdom. And not like most rodents, cavies do see a lot of colors accurately and are far from being color blind. Whether a guinea pig can see colors or not, there is no doubt that their sense of sight is significantly vital to these cute and chubby-cheeked creatures. As pet owners, it’s part of our responsibility to ensure that our cavy’s eyes are in good condition. We must keep a close watch on possible eye infections which can affect our pets. 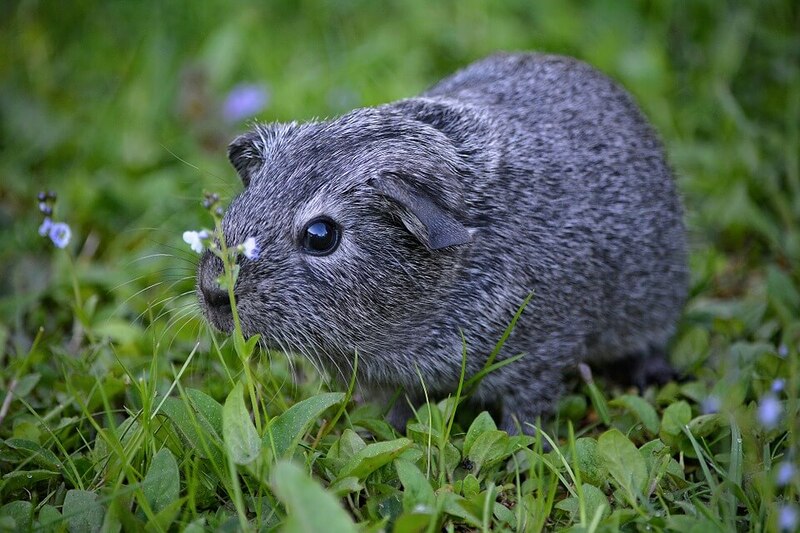 Below is a list of the most common eye conditions affecting guinea pigs. Corneal Disease is the most common eye condition seen on cavies. It is often caused by straw and hay trauma on the eyes. However, foreign bodies, as well as infection, can also be contributing factors. Just like conjunctivitis in humans, symptoms of this can include redness of the conjunctiva, inflammation of surrounding tissues, blepharospasm, and discharge. Factors that can trigger this eye condition amongst guinea pigs include allergies, environmental irritants, or infection. Although it is a fairly common eye condition affecting guinea pigs, only 1 out of 10 cases of cataracts can be seen using the naked eye. Cataracts happen either because of genetic reasons, or deficiency in certain nutrients, such as L- tryptophan. These conditions often require medical intervention by a clinical veterinarian. Careful observation for any visible changes in your pet’s eyes can significantly help in ensuring that they receive treatment at the earliest opportunity. It also improves the chances of a cure before the condition worsens. Numerous tests and research point to the fact that guinea pigs are indeed able to see colors. They cannot be color-blind. Some say that they like the color green while some people say that they get excited upon seeing a brighter color. Regardless of which color they want or what colors they can see, the real value of a guinea pig is its ability to feel and show a sense of appreciation to those who give them care. It means that color or no color, these friendly creatures can also see through their hearts. They can form a bond with their owners in ways as distinct as their colorful personalities.